SteriTherm™ VLA is an extremely versatile and robust module designed for aseptic heat treatment of a wide range of food products. The SteriTherm VLA is an aseptic heat treatment system intended for combining with aseptic fillers and/or aseptic tanks. The modular unit is pre-assembled on skids for easy, rapid delivery and installation. Heart of this module is the Viscoline™ annular heat exchanger that is ideal for use with highly viscous food products, providing exceptionally efficient heat transfer as well as considerable versatility in terms of both products and capacity. The design ensures gentle treatment with uniform heating/cooling and long runtimes, and is extremely reliable in operation. This results in very low service and maintenance requirements. SteriTherm VLA units are in widespread use in heat treatment sterilization i.e. pasteurisation of single and double-strength fruit purées of apple, berries, mango, guava, etc., fruit juice concentrates, jams and marmalades, baby food, banana, soups and sauces and a range of different tomato products. Superheated water at 125 °C (257°F) is used to pre-sterilize (SIP) the SteriTherm VLA unit for 30 minutes before any product is admitted. The product enters via the balance tank and is then pumped through the first heater, where circulating hot water heats it to the appropriate sterilization temperature. The subsequent tubular holding cell provides the product residence time necessary for effective treatment. 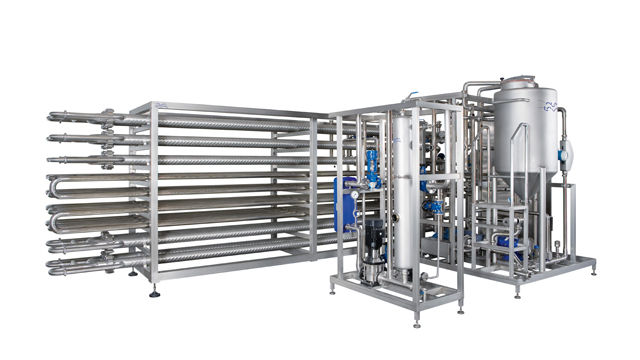 The product is then cooled in two stages, – by tower water and then subsequently by chilled water – before being led to the filler/aseptic tank. A diversion function is included to ensure that no un-treated product reaches the filler, should the heat treatment temperature drop below a pre-set value. For high acid products (pH<4.5) this is arranged in such a way that the production can restart as soon as the right temperature has been regained, without the need of a re-sterilization with water. Other versions include indirect heat recovery, combination with an Alrox deaerator module and in case of very viscous products, special high pressure designs.